PPF or ELSS which is good to invest in the question most investors think while doing tax planning. They are investing in these two only for tax saving. You should be investing goal oriented ( retirement, own house, etc) following asset allocation. In addition, If you can save some tax while doing goal oriented investment, then it will be a bonus to you. 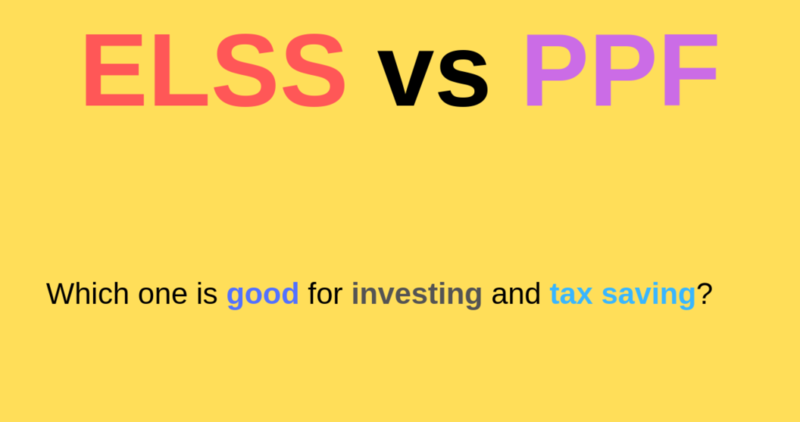 PPF vs ELSS – Which one is good for investment and tax saving? No, you can choose other tax saving instruments like Bank FD, NSC, EPF ( Private employees), GPF ( for Government Employees) etc also for saving tax under section 80 C.
You have to invest these for your financial goals like retirement and child higher education, own house etc based on the risk tolerance and following asset allocation. Here, for this kind of goal which is long term ( more than 15 years away) the ideal asset allocation will be Equity 70% and Debt 30% ( Fixed Income). However, ELSS falls under Equity while Public Provident Fund falls under Fixed Income. It depends on the total amount that you are going to invest for your retirement goal ( which we assumed above). Government Employees and Private Employees after doing a job for some years, As you have higher PPF or EPF contribution, their 80 C tax saving is already done. Here, in this scenario, they have to invest Rs.3,50,000 ( as you require to invest 70% towards your financial goal) in other Equity Mutual Fund or Stocks ( it should not be an Equity Linked Saving Scheme). As it doesn’t make sense to lock your money in ELSS for three years and 15 years in case of Public Provident Fund ( after tax saving under 80 c is already done). In this case, Invest 30% in Public provident ( part of fixed income) and 70% in open-ended Equity Mutual Fund which is not an ELSS ( part of equity asset allocation for retirement). Please do not ask this question. It depends on your needs and comfort. But following asset allocation is a must thing to do. Moreover, PPF, Debt, Bank Fd, GPF, and EPF fall under fixed income and ELSS and equity mutual funds and stocks fall under equity category. You should your combination according to your comfort without disturbing 70% equity and 30% fixed income for your retirement goal. However, your equity exposure should have to come down slowly over the years as your goal comes nearer. Investing Rs.1,50,000 in PPF, Rs.3,50,000 in Equity Mutual Fund ( not an ELSS FUND) or investing Rs.1,50,000 in Equity Linked saving Scheme and Rs.1,50,000 in PPF/EPF/NPS + Rs.2,00,000 in Equity Mutual fund (stocks) are same. As in both cases, the asset allocation is 70:30 in Equity and Debt for retirement goal. You should follow an investment planing without disturbing the asset allocation so that your investment will give you more inflation-adjusted return. It is not advisable to invest in Equity Linked Saving Scheme in monthly mode as each installment will be locked for three years. Hence it is always advisable to invest lump sum in ELSS Schemes. I will say not to avoid PPF in the asset allocation. As it safest E.E.E exempted fixed income instrument. I recommend you to use PPF as much as possible under the fixed-income category for your asset allocation. However, You can not invest over and above Rs.1,50,000 as there is a max limit of RS.1,50,000 for Individuals. As I said above, tax saving is important. But achieving your financial goals is far more important than saving tax. Hence, always try to invest goal oriented with proper asset allocation in equity and fixed income (debt). If you are not able to understand these concepts, A Sebi Registered Investment Adviser will help in doing so. Click this link to find a Sebi Registered Investment Adviser in your city.